If you are an employee or job seeker and believe you have been the target of unlawful discrimination and you wish to file a legal complaint, it's important to file with the Equal Employment Opportunity Commission (EEOC) as soon as possible. Also, another agency, organization or individual can file a complaint on your behalf in order to protect your identity. However, remember that your employer is legally forbidden from retaliating against you for filing a discrimination claim. It's necessary to file your complaint within 180 days of the incident. That means you have approximately six months to gather the necessary information and file your claim. If the charge is also covered by local laws, the filing deadline is extended by 300 days. However, it's a good idea to file the claim as soon as possible. Immediate action will help to guarantee a successful investigation of the claim. In order to officially file the workplace discrimination claim, you need to contact The Equal Employment Opportunity Commission (EEOC). You may file the claim in person at the nearest EEOC office, and you can also file the claim by mail or online. Here are step-by-step instructions on how to file a claim. A Charge of Discrimination can be completed through the online system after you submit an online inquiry and they interview you. EEOC’s Public Portal asks you a few questions to help determine whether EEOC is the right federal agency to handle your complaint involving employment discrimination. To contact your local EEOC office, you can call 1-800-669-4000 for voice access, or the 1-800-669-6820 "TTY" number for deaf or speech impaired individuals. When you file the discrimination claim, you will need to provide your name, address, and telephone number. Also, be prepared to provide specifics about your employer, including their name, number pf employees, address and telephone number. You'll need to be able to describe the incident and provide dates of the violations, as well. Provide any documentation such as memos or emails that help establish any violations. If possible, provide the names, addresses, and phone numbers of any witnesses who can corroborate your allegations. After your claim is filed, the EEOC will launch an investigation of your incident. Depending on the significance of the details you provide, your case may receive an immediate priority investigation, or it may be assigned a review to determine the likelihood of illegal discriminatory practices. During the investigation, the EEOC may visit your work, request additional details, conduct interviews, or review documents. 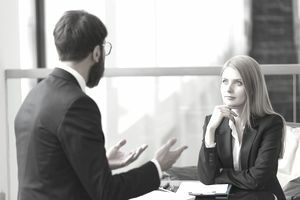 If preferable to an investigation, mediation can be provided if both you and your employer are willing to cooperatively discuss the incident. If mediation proves to be unsuccessful, the EEOC will revert to further investigation in order to resolve the claim. If the EEOC establishes that discrimination did occur, you can expect to receive compensation in various ways, including hiring, promotion, back pay, front pay, reinstatement to the position or any other appropriate accommodation. In some cases, you may be compensated for legal fees or court costs. If the EEOC is unable to resolve the charges, you will be notified that you have a 90-day window to sue your employer if you choose to do so. In this situation, it's advisable to contact a lawyer who specializes in discrimination cases. Before filing a discrimination charge, review your employer's anti-discrimination policy to determine if it's possible to file a complaint with your company directly. If your employer has instituted internal grievance procedures, it may be a good idea to file a claim internally as well as contacting the EEOC. Try to keep track of when the discrimination happened. Recording specific dates and details will make for a more thorough and accurate investigation of the incident. Remember to file your complaint as soon as possible in order to fully protect your legal rights. Cooperate fully with the investigation of the claim. It's important to provide as much detailed information and evidence as possible. Don't be afraid to file the discrimination claim or cooperate with investigators. Your employer is legally prohibited from retaliating against you after you file the claim and is also forbidden from creating a hostile work environment due to a discrimination charge. Contact your state EEOC for specific information regarding your situation.